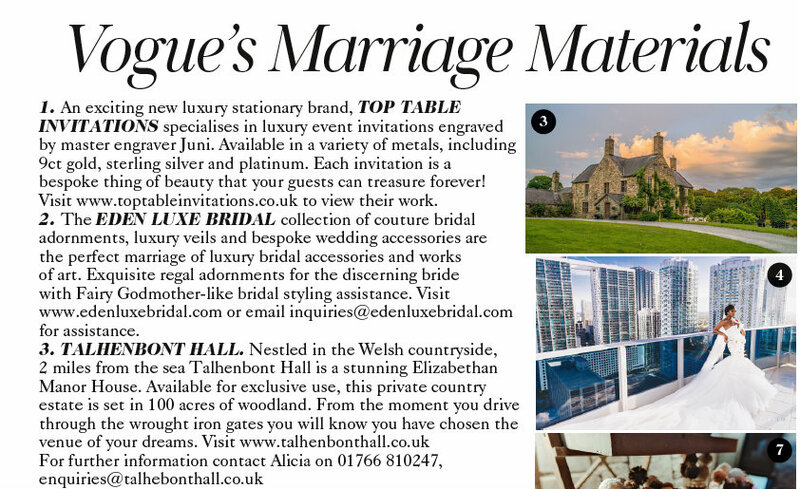 We are delighted to announce that Talhenbont Hall can be seen in ‘Vogue’. 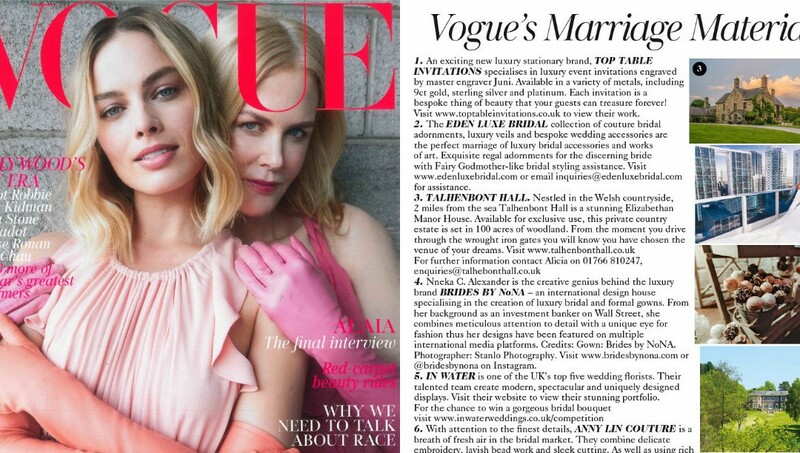 We are in the February edition of the iconic fashion magazine, listed in the ‘Vogue’s Marriage Materials’ edit amongst a luxury stationery brand, a couture designer bridal shop and more. This has been a fantastic start to our 2018 and we look forward to what the rest of the year has to bring. We are passionate about what we do and dedicated to helping you achieve your dream wedding. We are a family run business and offer a completely bespoke service, tailored to meet your every need. Because we are surrounded by spectacular landscapes, you get complete exclusivity to celebrate your big day in private with your close family and friends. Choosing a wedding venue is one of the most important and exciting aspects of planning a wedding, it’s where you make some of your loveliest memories with the ones you love. We will be holding an open day very soon where you can meet our award-winning suppliers and sample some canapes and fizz – watch this space for more details shortly. Our diary is quickly booking up and so we encourage you to arrange a viewing as soon as possible to ensure you get the dates you want. We are always happy to answer any questions you may have and discuss how we can help you make your dream wedding a reality. Why not have a read of our latest blog post ‘Questions To Ask A Wedding Venue’ where we cover a range of vital aspects of finding the perfect venue?